I was in Nairobi for a few errands this weekend, one of which was to go shopping for some clothes. I realized recently that my wardrobe was in pretty bad shape. A few months ago my Che Guevara shirt was stolen from the laundry line and last week my bike accident destroyed my only pair of jeans and one of my nicer shirts. I decided it was time to invest in some clothes. Boom! And all the hawkers were running again. Down the street I saw some smoke but couldn’t make anything of it. As I kept walking a police officer ran past me with some canister and then boom! Tear gas! I briskly walked away from the action and saw a big truck full of police officers. I thought, “this is crazy” and, as I had already bought one shirt for about two dollars, headed back towards Nairobi’s town center. 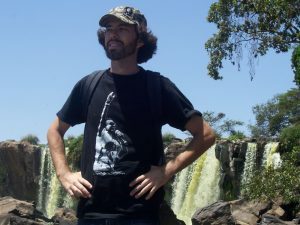 Lover of GNU/Linux, Death Metal, and Indian food, blogs about living and working in Nairobi, Kenya. Enter your email address to subscribe to this blog and receive notifications of new posts by email. No spam, I promise!